Erma Jean Young obituary. Carnes Funeral Home. Erma Jean was born February 6, 1926 in Overton, Texas to the late George and Lena B. (Jones) Sherow. She was the ninth of fourteen children, all known by their nicknames which she repeated like a song. Even during her transition, Erma was singing, “Sister; Tut; Mer; Chuck; Bud; Teal; Nip; Rip; Nab; Olen; Joe; Sang; Glit.” Erma Jean attended Antioch High School in Henderson, Texas and graduated as Salutatorian of her class. How proud she was to lead her class of “five”! After graduating, she followed her sisters to Jarvis Christian College in Hawkins, Texas with the ambition of becoming a school teacher. She was married to James Lloyd Young for 45 years. In 1948, he moved her from the cotton fields of Tatum, Texas to establish roots in Dickinson, Texas where they raised six children. In 1956, Erma Jean united with Greater New Hope Missionary Baptist Church under the leadership of Reverend N. J. Wilson. Years later, under the leadership of Rev. Quincy B Rogers, she was appointed head of the Senior Usher Board where she served proudly and diligently. 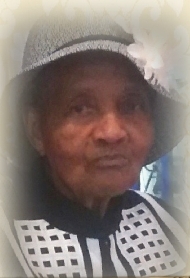 She remained a faithful member of Greater New Hope Missionary Baptist Church under the leadership of Dr. William H. King III until her health started to decline. After the couple relocated to Dickinson, Erma soon found her way into the workforce. She was one of the area’s most talented salad chefs. Erma worked in some of the most exclusive restaurants and country clubs. She retired in 1984 from Lakewood Yacht Club after 13 years of faithful service. The start of retirement created an uneasy experience for Erma. She began to take up hobbies such as quilting, and self-taught piano playing. After becoming an empty nester in 1985, Erma found her niche. She opened, “Jeanie’s Go Go Shop”, where she cooked and sold all types of food and desserts right from the comfort of her back yard. Her special “Cat Fish Fridays” would have her yard filled with customers every Friday evening. All agreed that her burgers were pretty darn good, too!!! Erma operated her home business until the death of her husband, James, in 1993. During her senior years, Erma’s happiest moments were spending her mornings at Dickinson Community Center in the Senior Program. Oh how she loved to play cards and bingo, four boards at a time! She meticulously lined her pockets with souvenir plastic forks, spoons and knives, only to be discovered by her daughter, Rose, who returned them by the bagful. Erma Jean leaves to carry on her legacy 4 daughters, Rose Palmer (Freddie) of Dickinson, TX; Erma Boudreaux of Coppell, TX; Derrell Phillips (Ronald) of Compton, CA; Loretta Stephens (Rawn) of Houston, TX; her son, Jeffrey J. Young of Dickinson, TX. ; 2 sisters, Eudie Brown (Sang) of Gardena, CA and Gladys Poindexter (Glit) of Bedford, VA; 8 grandchildren; 8 great grandchildren; 2 step grandsons; and many loving relatives and friends. Preceding her in death are her parents, George and Lena Sherow; her husband, James Lloyd (Slim); her son, James William (Jay); 2 granddaughters, Angela Joseph and De' Andria Anderson; and 11 siblings. There will be a public visitation held on February 9, 2019 at 10am and service to begin at 11am at Greater New Hope Missionary Baptist Church 1725 TX-3, Dickinson, Texas 77539. Burial to follow at Forest Park East.